Lightweight at 0.53 lb, the rugged and portable 500GB G-DRIVE ev RaW USB 3.0 Hard Drive with Rugged Bumper from G-Technology is designed for those who require on-the-go access to their personal and/or professional files, photos, videos, music, and more. When the included removable bumper is attached to the drive, it is better protected against falls of up to 4.9' / 1.5m on a carpeted concrete floor. If the bumper is not being used and the drive sustains a fall, it still receives some protection, but only up to 3.9' / 1.2m. Moreover, the G-DRIVE ev RaW is outfitted with technologies that enable transfer speeds of up to 136 MB/s. This drive is well suited for performing various tasks, such as backing up, editing, transferring, and general storage, as it is equipped with a 500GB capacity and 7200 rpm. The drive has two built-in interfaces - USB 3.0 and SATA. The USB 3.0 interface is backwards compatible with USB 2.0 and will allow users to connect the drive directly to their desktop or laptop. For those who wish to utilize the drive's SATA interface, this may only be done using the G-DOCK ev with Thunderbolt, the G-SPEED Shuttle XL with eV Bay Adapters, or the G-SPEED Studio XL with ev Bay Adapters. It is also compatible with the ev All-Terrain Case. While the G-DRIVE ev RaW does come preformatted for Mac 10.9 and later, it can be easily re-formatted for Windows 10, 8.1, 8. and 7. This drive is also compatible with most Evolution Series G-DRIVE ev products. 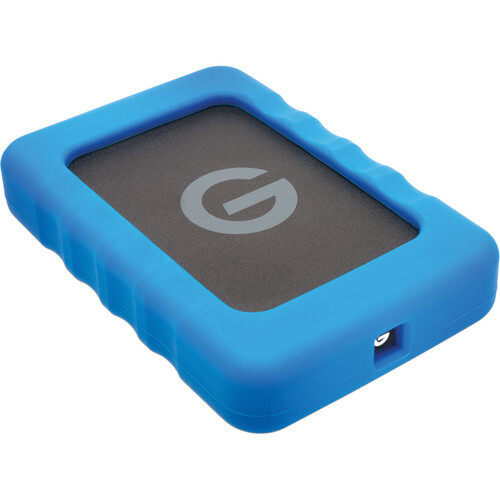 The 500GB G-DRIVE ev RaW USB 3.0 Hard Drive operates solely using bus power and includes a USB 3.0 cable. Box Dimensions (LxWxH) 7.9 x 6.1 x 2.0"